Search for all "HOXB7 / HOX2C"
Rabbit anti Bovine, Canine, Equine, Guinea Pig, Human, Mouse, Porcine, Rabbit, Rat, Zebrafish HOXB7 / HOX2C. The immunogen for anti-HOXB7 antibody: synthetic peptide directed towards the C terminal of human HOXB7. Synthetic peptide located within the following region: RYLTRRRRIEIAHTLCLTERQIKIWFQNRRMKWKKENKTAGPGTTGQDRA. HOXB7 is a member of the Antp homeobox family and is a protein with a homeobox D-binding domain. The nuclear protein functions as a sequence-specific transcription factor that is involved in cell proliferation and differentiation. Increased expression of this gene is associated with some cases of melanoma and ovarian carcinoma.This gene is a member of the Antp homeobox family and encodes a protein with a homeobox D-binding domain. It is included in a cluster of homeobox B genes located on chromosome 17. The encoded nuclear protein functions as a sequence-specific transcription factor that is involved in cell proliferation and differentiation. Increased expression of this gene is associated with some cases of melanoma and ovarian carcinoma. Transient overexpression cell lysate was tested with Anti-HOXB7 antibody (H00003217-M01) by Western Blots. 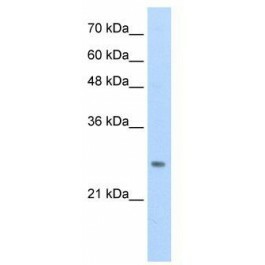 Transient overexpression cell lysate was tested with Anti-HOXB7 antibody (H00003217-M02) by Western Blots.